The official theme of International Biodiversity Day in 2010 is "Biodiversity for Development". The first and foremost purpose of all related Action Days, therefore, is to raise public and political awareness, at the national and international levels, of the significance of ecosystems and biodiversity for human well-being. Previous Biodiversity Action Days have shown that this can be achieved by inviting a variety of stakeholders to jointly analyze a specific ecosystem; by helping them to arrive at new insights and "A-Ha's"; by providing an attractive program surrounding the event; by accompanying the activities by expert panels that are open to the public; and by involving the media to broadcast and report on the related experiences. The International Year of Biodiversity 2010 provides excellent opportunities to scale up this approach and create a global mosaic of the value and meaning of ecosystems to humankind. Simultaneous Biodiversity Action Days in up to 50 countries will broaden public awareness of the CBD and its objectives, and will stimulate the political debate around options for its preservation and sustainable use. 2010 marks a year of key targets under the Convention for Biological Diversity (CBD). The UN General Assembly in September and the Conference of the Parties (COP) to the CBD in October 2010 will assess progress made. Scientific input for these evaluations will come from "The Economics of Ecosystems and Biodiversity (TEEB)", a study to demonstrate how biodiversity and ecosystems impact on the world economy. Furthermore, all countries are being asked to promote public awareness of the importance of biological diversity. International Biodiversity Day is a public event that serves to highlight the importance of ecosystems for human wellbeing. For 2 to 4 weeks around 22 May, a broad range of people in the participating countries will be invited to jointly explore and analyze a local ecosystem. The idea is to evaluate and demonstrate the value of this ecosystem and its biodiversity in a way that is easily understood by everybody. In cooperation with the TEEB team the "value" of exemplary ecosystems will be assessed. Governments, foundations, companies, non-governmental organizations, the media and other partners are invited to join in and contribute to their local event. With joint efforts from all individual partners a global picture of what biodiversity provides for human beings will be drawn. As the name implies, a national Action Day on Biodiversity brings people to action. A broad variety of stakeholders come together at a previously defined site, to analyze the features of this specific ecosystem. Typically, participants are given a straightforward task, such as collecting samples of all species they can find on that site. Scientists accompany mixed groups of participants to help them assess the characteristics of species, links between them and the ecosystem as a whole. All results are then gathered and analyzed together and with the help of experts. This exercise alone provides ample space for new and often surprising insights. However, these biomonitoring activities are only one element of what may constitute a fascinating national Action Day. In the past, some countries have chosen to combine it with related events, to further increase the attractiveness of the Day for the public and media. For example, a three-day Sustainable Living Festival was held preceding the Biodiversity Action Day in South Africa in 2008, and the Action Day itself ended with a Gala Dinner where the preliminary results were presented. In 2007, Viet Nam organized an International Symposium on Biodiversity and Climate Change, as a follow-up of the national Action Day. All activities are to be covered in print, in audio form and/or in film for national publication. There will be a film with reports from most of the participating countries and a (photo) presentation, both of which are to be shown in the margins of the special session on biodiversity of the UN General Assembly and the CBD Conference of the Parties in 2010. GEO will publish reports in the German and international editions of GEO. In addition, all events will be showcased on this website. Other national and international media are being approached and invited to collaborate. The resulting global mosaic of national experiences will help furnish a more complete picture of the contributions eco-systems make to human development. This, in turn, will help increase public commitment to the conservation and the sustainable use of biodiversity. The value of nature has a range of dimensions from the spiritual to the economic. As the International Year of Biodiversity approaches in 2010, TEEB - a study on The Economics of Ecosystems and Biodiversity - is showing that the failure of markets to adequately consider the value of ecosystem services is of concern not only to policy makers, but also has direct consequences for business and all of us as citizens and consumers. The study is emphasising the need for change. TEEB was launched by Germany and the European Commission in response to a proposal by the G8+5 Environment Ministers (2007) to develop a global study on the economics of biodiversity loss. This independent study, led by Pavan Sukhdev, is hosted by the United Nations Environment Programme with financial support from the European Commission, Germany and the UK, more recently joined by Norway, the Netherlands and Sweden. For more information on TEEB please visit www.teebweb.org. The lack of market prices for ecosystem services and biodiversity means that the multiple benefits we derive from these goods (often public in nature) are usually neglected or under-valued in decision-making. Understanding and capturing the value of ecosystems can lead to better informed and possibly different decisions; accounting for such value can result in better management; investing in natural capital can yield high returns; and sharing the benefits of these actions can deliver real benefits to those worst off in society. Put simply, making the benefits of biodiversity and ecosystem services visible to society is necessary to pave the way for more efficient policy responses. The mosaic of national Action Days around International Biodiversity Day on 22 May 2010 provides a starting point to demonstrate some of these values in a very practical way. You are encouraged to consider a wide range of options when selecting an ecosystem for the national Action Day in your country. Ecosystem benefits you may want to think about include, water provision, climate stabilization, pollination for agriculture, tourism, coastal protection, nutrition, provision of genetic resources, carbon sequestration, water purification, etc. Since 2001, the German Ministries for Economic Cooperation and Development (BMZ) and for Environment, Nature Conservation and Nuclear Safety (BMU) have been partnering with GEO Magazine to organize "Biodiversity Days" in Germany and in various developing countries. Local leaders, political decision makers, biodiversity experts and key media have worked with ordinary people to carry out these national action days. Related events have been organized with up to 1,000 people taking part. They have received broad media coverage in Germany and the countries in which they were held. In 2007, for example, an event exploring "Biodiversity and Climate Change" took place at Tam Dao National Park in Viet Nam. "Biodiversity Days" have thus contributed - like in Viet Nam - to political agenda setting and promoted the conservation of biodiversity in more than 10 countries. Building on these successful experiences, the two German Ministries and GEO Magazine are now inviting new partners to organize simultaneous "Biodiversity Days" around the globe. Some 50 nations have been invited to participate in this global event. While each country is free in designing its own national event, some degree of overall guidance and coordination will be necessary to ensure coherence and make it possible to compile the results in a series of international presentations. The Steering Committee is responsible for overall guidance and decision making regarding the global project. It consists of the German Federal Ministries for Environment, Nature Protection and Nuclear Safety (BMU) and for Economic Co-operation and Development (BMZ), GEO International and the coordination office of the global study The Economics of Ecosystems and Biodiversity (TEEB). The Project Coordination unit will serve as 'Helpdesk' for the national implementation teams in participating countries, to whom it will provide organizational guidance and content-related support. Besides, it is responsible for the global coordination of activities, for compiling the global mosaic of national experiences, and for ensuring appropriate presentation of the results at international level. These tasks have been assigned to GeoMedia, a consulting firm based in Bonn. The National Implementation Teams will be designated by the CBD Focal Points in each country. The teams are responsible for organizing and implementing the Action Day at national level. They will receive guidance and support upon request from the Project Coordinators (GeoMedia), and will feed back selected results of the Day as part of the global mosaic of national experiences. 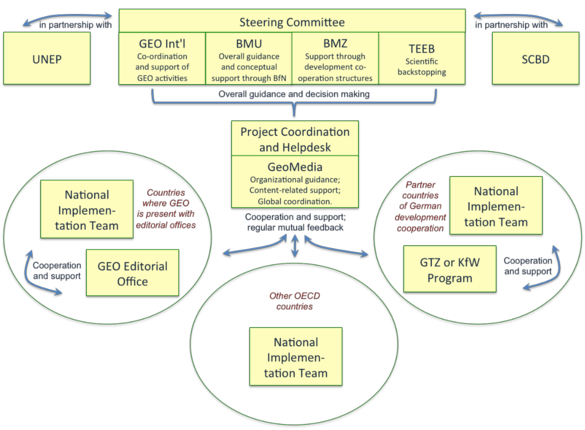 In countries where GEO Editorial Offices and/or suitable German development cooperation structures (GTZ or KfW) exist, they will cooperate with and support the National Implementation Teams. The Steering Committee and the Project Coordination unit will be closely cooperating with the Secretariat of the Convention on Biological Diversity (SCBD) and the United Nations Environment Programme (UNEP) to ensure coherence with international events and other activities in the context of IBD 2010.